“Weak signals” are the equivalent of a canary in a coal mine. They are the unspoken needs and wants of your customers, and they are also the arrows pointing to what your customers are going to need and want in the future, even if they themselves don’t know it yet. If you pay attention to the weak signals, they’ll give you the heads-up that something radical, and possibly uncomfortable, is coming your way. You’re not going to find them on the front page of a newspaper or in an industry analyst report. If you are pitching me an idea that’s already been covered in an analyst report, forget it. You’re too late. If you’re pitching me a weak signal that you uncovered during a customer conversation or found in an obscure magazine or local paper you picked up on a layover on the other side of the world, OK, I’m interested. I find weak signals in the comments on a blog post, or in a casual observation that my kid’s friends might make at dinner one night. 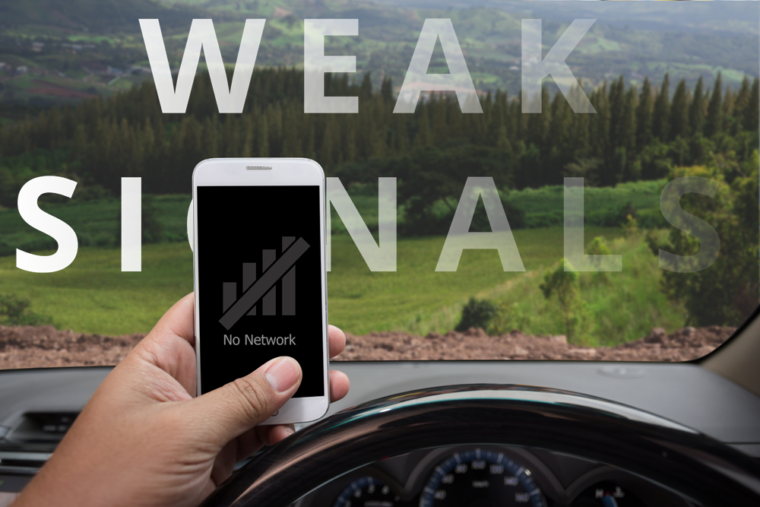 A weak signal is something that seeps into the zeitgeist almost unnoticed. One week you’ve never heard of it, the next it’s a fitness or shopping craze that all your friends have signed up for. And when weak signals intersect with the “Rule of Five,” I really start to take notice. Essentially, the Rule of Five means that I’ve heard the same core message that “something new is happening here” five times within a short time span. Here’s a good example of how a weak signal about a cultural shift brought me to the moment where I said to myself, “I need to think about this.” I’ve always been interested in graffiti, and I make a point to observe it when I’m traveling. It’s an interesting look into the thoughts and interests of groups of people I will never interact with. It’s an elaborate, and sometimes quite visually stunning, way of saying “I was here, this is who I was, and this is what I was thinking at the time.” I remember visiting a small and obscure French castle, well off the tourist route. On the walls of a moldering dungeon someone had chiseled the outline of his hand and carved words to the effect of pierre was here. It dated to the late fourteenth century. People have always felt a deep-seated need to announce their presence—no matter how fleeting—in the world. Fast-forward to the early 1990s. I buy lots of completely random magazines when I’m traveling—anything from Eastern European news magazines to music papers to local ’zines and newspapers. Years ago I picked up a copy of a magazine called Graphotism in the old Tower Records store in Piccadilly Circus. It’s a magazine aimed at graffiti artists. The magazine showed pictures of graffiti art from all over the world but also highlighted gallery exhibitions built around graffiti. What was once considered a crime was now being shown in galleries, being sold to early adopters and eventually ending up on the walls of people’s condos. Now, this was all interesting, and it appealed to me as a former architecture and design student, but it didn’t necessarily herald that a big change was happening. The magazine and the gallery exhibits were weak signals, but they were still isolated weak signals. Not long after I became aware of this weak signal, an early mobile application came out called Tag and Scan. Tag and Scan allows you to leave digital graffiti. The app lets you type out opinion messages, such as an opinion of a local restaurant, and digitally suspends it in front of a destination. This is graffiti set to maximum. It used to be that if a restaurant was tagged with unflattering graffiti the owner could scrub it off. But with digital graffiti you could now leave a virtual message, and the owner can’t do anything about it. This transition from obscurity or niche to the edge of mainstream is the first hint of broad adoption of something new. Transitions like this are hard to see but when you do find them, jump on it. The Tag and Scan application was an early experiment and was limited to a small section of London, but I recognized that this program hinted at something bigger. Today we have seen an explosion of location-based services like Foursquare, Yelp, and more recently Facebook. They are the direct successor to Tag and Scan, and they tap into the same desire to be known, to be remembered, and to have your opinion felt and heard—the same desire that causes people to chisel their name in rock, or tag a wall with an aerosol can. Nothing is worse than being anonymous and unnoticed, and each of these examples evolved from the thing that came before. The leap from physical to digital graffiti was a catalyst to all kinds of location-based services. Of course, the trouble with weak signals is that they are exactly that—weak. Until the Rule of Five kicks in, it’s easy to ignore them, or tell yourself that nothing’s going to happen with these trends. Which is why I’m not telling you about my big launch and hugely successful product that is a direct descendant of Tag and Scan. Despite my fascination with graffiti culture, I missed the ways in which the “I was here” sentiment could be adapted to social technology. Now, this oversight was more to do with the slow pace of adoption rather than underestimating the importance of the graffiti mind-set. Keep in mind that we are talking about a weak signal that took almost fifteen years to go from fringe to broad adoption. It’s easy to get distracted and fall into the trap of thinking that it will never make it. So, what’s the next trend or fad that is giving off a weak signal? What hints did you get before major changes in customer behavior, product innovations, or shifts in the marketplace occurred? What nonstandard input (e.g., reading fringe magazines) do you use as a way to find weak signals? How do you share these emerging trends within your organization?